Contains: Water (Aqua), Sodium Cocoamphoacetate, Glycerin, Lauryl Glucoside, Sodium Cocoyl Glutamate, Sodium Lauryl Glucose Carboxylate, Cocamidopropyl betaine, Caprylyl/Capryl Glucoside, Coco-Glucoside, Glyceryl Oleate, Hydrolyzed Wheat Protein, Laurdimonium Hydroxypropyl Hydrolyzed Wheat Protein, Polyquaternium-7, PEG-150 Pentaerythrityl Tetrastearate, PPG-2 Hydroxyethyl Cocamide, Trideceth-9 PG-Amodimethicone, Trideceth-12, Sodium PCA, Sodium Lactate, Arginine, Aspartic Acid, PCA, Glycine, Alanine, Serine, Valine, Proline, Threonine, Isoleucine, Histidine, Phenylalanine, Equisetum Arvense (Horsetail) Extract, Urtica Dioica (Nettle) Extract, Essential Oil Based Fragrance, Tetrasodium Glutamate Diacetate, Phenoxyethanol, Benzoic Acid, Dehydroacetic Acid, Ethylhexylglycerin, Citric Acid. 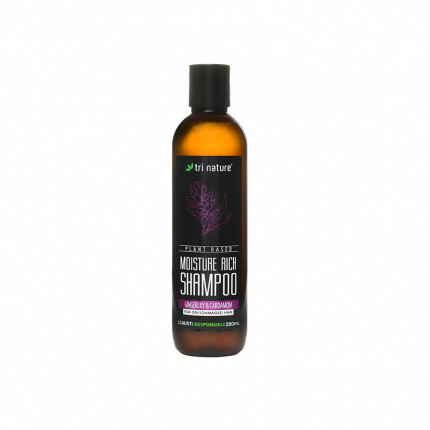 A gentle and protective naturally derived shampoo with a divine Lavender & Patchoui essential oil based fragrance, formulated to nourish and protect colour treated hair. The sulphate-free shampoo is exceptionally gentle and will not strip colour from hair. The moisturising conditioner is fortified with Wheat Proteins, Amino Acids, Panthenol, Vitamin E and extracts of Horsetail & Nettle to protect colour and ensure shiny, radiant hair. A gentle and moisturising, naturally derived shampoo with an exotic Ginger Lily & Cardamom essen..
A gentle and protective naturally derived conditioner with a divine Lavender & Patchoui essentia..